Vintage - Royal Sealy China of Japan, Tea Cup & Saucer, in a Purple Violet Pattern, Circa 1950's. A Dainty Tea Cup & Saucer, in the Purple Violets Pattern, by Royal Sealy of Japan. From the 1950's Era. Beautiful White China, ringed by (3) Concentric Circles of 22kt Gold (Inner and Outer Verges and Rim), and Violet Bouquets as Flower Pattern. What a Great way to start your day, with a Cheery Cup of Tea and a Beautiful Bouquet of Violets. Great Condition. 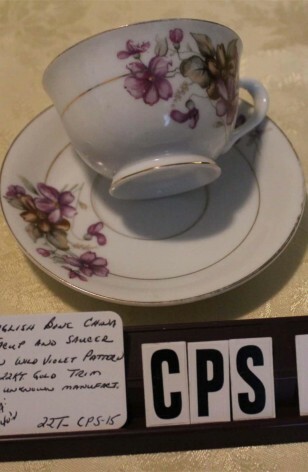 A Dainty Tea Cup & Saucer, in the Purple Violets Pattern, by Royal Sealy of Japan. From the 1950's Era. Beautiful White China, ringed by (3) Concentric Circles of 22kt Gold (Inner and Outer Verges and Rim), and Violet Bouquets as Flower Pattern. What a Great way to start your day, with a Cheery Cup of Tea and a Beautiful Bouquet of Violets. Very Good Resale Condition unless noted below or in pictures. 1 - Saucer - 5 7/8"